"Why did some of the accused witches confess?" You nswered that question yourself: Mass hysteria. Other cases of mass hysteria also involved people that were involved to believe to be possessed by the deviland it could easily spread to people who were originally not suffering from the psychosis. Also some of the accused were threatened with torture and in some cases torture ("pressing") actually was performed. I still believe that ergot poisoning was the intial instignator, mainly because that would explained why the witchcakes brought "results", but the signs of a mass hysteria are unmistakable. Another thing that sets the Salem trials apart from the European witch trials was the racist background. Tituba, a black slave woman, was the first person to be accused of witch craft. THe racism that was prevalent at the time made her an easy target. 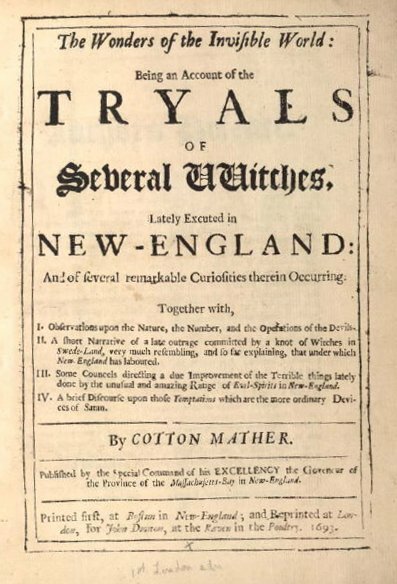 Remarkable th magic as it was described during the trials was a mix of European lore (witches' flight)and the white settler's perception of voodoo (using dolls for curses). Tituba's "cofession" was very influential and the judges would ask the other accused about the kind of magical practices she described. Tituba allegedly told some young women about Voodoo before the incidents. The fear of the unknown, caused by the "new" kind of magic, might have exarbated the conflict. It would have not been the first time that a culture clash stood at the centre of a witch or vampire pandemic. It is very telling that group which had so much power over a minority still felt so threatened by their different culture. Fear of the uknown is a deeply human trait, many fairy tales show that. But it can also be deeply problematic. Nowadays, in a new era of culture clash it is important not to forgetthe simiarities that we shre with all hmansoverour differencs, so we don't loose ourselves to panic again. The book didn't mention anything about torture, although of course that doesn't mean it didn't happen-there was one mention of girls being pressured into accusing certain people. And since their method of interrogating was to have all the girls together they could feed off of each other rather than trying to make sure all the details lined up separately. The concept of mass hysteria is pretty mind boggling-that it could allow some girls to see themselves as victims and some as criminals. I wished the book had dug into a psychological analysis more, or presented a modern interpretation of the events as they occurred. I don't think Tituba was actually black, ie not African. We get this idea from The Crucible - a wonderful play, but really about the U.S. in the1950s, not Salem in 1692. She was an Arawak. But she would certainly have been exotic in that community, who would have arrived from Europe with all that scary folklore to start with. The wilderness would have been full of evil, for them. I agree with the ergot poisoning theory. Apparently, there had been a wet spring and by the time of harvest the grain would have been rotting. Those girls, apart from the other elements described above, would have been on bad LSD trips! Things haven't changed much on the mass hysteria front - the point Arthur Miller was making, actually. Nobody is hanged for being different in our Western countries, but that's about the main difference. In my country, it's the refugees who are, among other things, being simultaneously accused of coming to take our jobs and accused of living on welfare! Thanks for chiming in, I always assumed that she was black, because she is usually depicted that way, both in contemporary art and more modern interpretatins like The Crucible. Of course 17th century art is not the best source to look at for information about someone who is part of a minority and modern interpretationsoten draw on the folklore rather than the facts. I did some research and at least according to the official Salem Witch trials website, Tituba's race is not clearly ientified due to many contradictory documents (http://salem.lib.virginia.edu/people/tituba.html). Where did you hear she was Arawak? It's not that I don't believe you, I'd just like to compare sources. Nevertheless the confusion of the (white) sources about her race only seems to strengthen the argument that her exoticism was the source of mistrust. The people were not interested in why she was different or whether she was Native Anerican, African, Carribean or of mixed hertigage. It only mattered that she was different and that was enough to antagonize her. As for todays society, I do think we've cme a long way, but we've gt an even longer way to go. The refugee crisis stirred up some long repressed issues in our society. An open discourse about the society we live in, the issues it already has and the issues the new situation brings is barely possible without agitating people on both sides. However unlike in Salem, at least it is possible at all. And I think that's a big step forward. Wikipedia. ;-) Where I looked it up after a post in another blog. Julia, you seem an interesting lady. I've read your comments on. Number of folklore blogs. You don't seem to have a blog I could follow or a web site. Do you do any social media at all apart from commenting on blogs? Yes the book confirms Tituba was Native American (I wasn't sure if I was confusing her with the other slave in the household). And I agree, Julia, you have so much knowledge on so many different topics! I would love to read more of your thoughts! Ah, ok, I'll look into more sources about Tituba then. Ya make me blush.^^ While I do have social media, that wouldn't help you two much since it's all in German. I've been thinking about starting an English blog though, and now I think I have one less excuse not to do it. Fascinating subject and such a shame that there is so little truly acurate information on the Witch trials in all countries. I did a pilgramage trip of the Pendle Witches here in the UK last year and found myself so sad for those women who were accused and hung. I never truly cared or even liked the Puritans at all. Their religion was both boring and cruel; no Holidays, no Theater, no Maypoles, no games or dancing, no sports, no art, no public intimacy or kissing in public (especially if couples were married), etc. Though they did had some music (though very religious in nature), poetry, and a few celebrations concerning births and baptisms and the like (though they were still somber and serious in nature), the Puritans also had a strict authoritarian manner and believed God was always angry and vengeful. Though their love for God was sincere, they exorcised that with cruelty and fanaticism. I never saw them as a happy crowd. To them, happiness in this life is sinful because they believed humans were inherently sinful and wicked. Kind of ironic considering their jerky behavior toward others (such as the Quakers, Catholics and Native Americans). Yeah, I think Puritans are maybe glorified a little because of their role in American history, remembered for seeking freedom of religion and bravely journeying to the new world but the more negative aspects of their religion and behavior ignored. Their beliefs were very legalistic and judgmental. Reading the book made me all the more grateful I live in this current culture!